Search for all "Hev b1"
Mouse anti Hev b1 1. Product is tested for ELISA (detection), Enzyme Immunoassay, Western blot / Immunoblot. 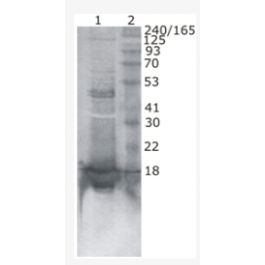 Hev b1-MBP fusion protein expressed and purified from E. coli. ELISA: 1/32 000. Reacts as Detection antibody in Capture ELISA with Hev b1 detection monoclonal antibody Cat.-No AM33427PU-N.
Recombinant and native Hev b1 (Rubber elongation factor, REF).